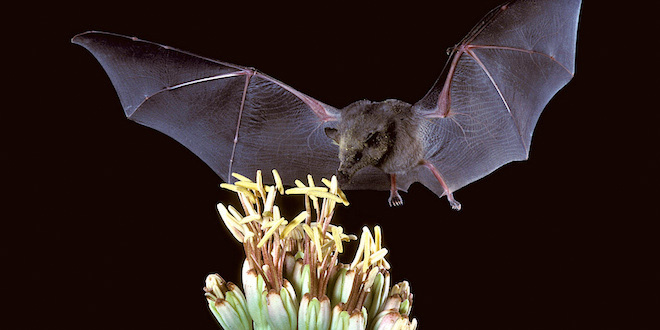 According to Vallarta Daily newswebsite, wildlife officials announced it might be time for a toast now that a once-rare bat important to the pollination of plants used to produce tequila is making a comeback. On Thursday January 5th, the U.S. Fish and Wildlife Service proposed removing the lesser long-nosed bat from the endangered species list. Mexico delisted the bat in 2015, and if approved in the U.S., this would be the first bat ever removed from the nation’s list of threatened and endangered species. Federal officials said it has taken 30 years of conservation efforts by biologists and volunteers in Mexico and the U.S. as well as tequila producers in Mexico to rebuild a healthy population. Jim deVos, assistant director of wildlife management at the Arizona Game and Fish Department, called the proposed delisting a great achievement. “Many entities in both the U.S. and Mexico have worked tirelessly toward recovery and this announcement stands as testimony that dedicated efforts and sound management practices can lead to recovery of endangered species,” he said in a statement. The flying mammal ranges from Mexico to southern Arizona and New Mexico. It depends on the nectar of agaves, cactuses and other flowering plants in the desert region. In southern Arizona, residents for a decade have monitored night-time bat use of hummingbird feeders. This provided biologists with a clearer understanding of migration timing and allowed for the opportunity to capture bats and affix radio transmitters that aided in finding roost sites. Federal land managers in New Mexico and Arizona, including at the U.S. Army’s Fort Huachuca, are including forage plants such as agaves, saguaros and other cactuses in their resource management plans to help the species. Limiting human access to caves with roost sites and abandoned mines in the U.S. also has benefited bat populations, officials said. Recovery efforts also have included education aimed at changing attitudes about bats and improving identification of different species. Historically, the lesser long-nosed bat was a victim of early campaigns to control vampire bats over rabies concerns and their effects on livestock. Biologists also considered the potential effects that climate change may have on the “nectar trail” that the bats follow as they migrate. They say the bat is flexible and adaptive enough to remain viable under changing conditions. The Fish and Wildlife Service is taking comments on the proposal through March 7. A final decision will follow.